Luncheon menu from the Rigadoon Room in the Edgewater Hotel, with a gargoyle figure against a background of tied-back drapery, and spot illustrations of the hotel, diners, a chef, a sailboat, and the hotel crest on the menu pages. Printed in teal and black. Original loaned for scanning. 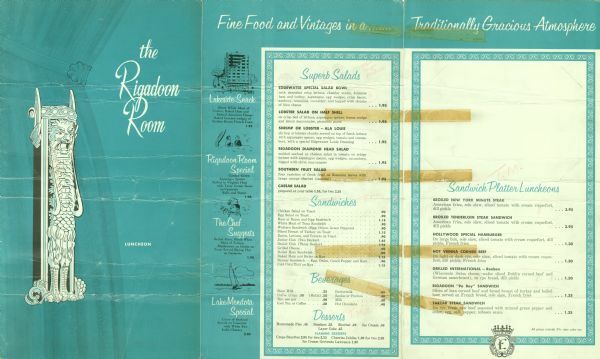 For other menus from the Rigadoon Room, see also Image IDs: 105164 and 105166.